** Will a gun in your hands kill you - or protect you? Does a Gun in Your Hands Kill or Protect You? 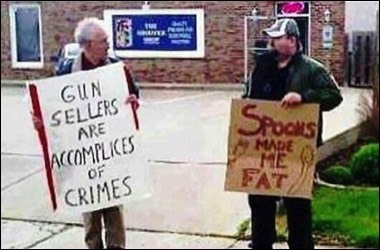 If guns are responsible for killing people, then are spoons responsible for making people fat? Are beds responsible for women becoming pregnant? Such mistaken thinking may be behind fundamentalist Muslims insisting their women are covered from head to foot, so that men are neither attracted nor tempted by their beauty. Although those in the western world like to think they know how to think, gun control fanatics nevertheless apply that same thinking to guns. There are even control freaks who apply this erroneous thinking to cans and bottles. If enormous quantities of cool drinks are bad for you, then the government must ban the sale of large size drinks. It seems that the nanny politician running New York doesn't understand the concept of individual responsibility and tried to institute such a law! Fortunately, the courts have more sense and struck it down as unconstitutional. The US Government itself has issued a list of the ten biggest killers, thanks to liveleak.com for this image. By far the biggest annual killer is tobacco, responsible for over half a million American deaths a year. The second is Medical Errors causing some 200,000 deaths annually - well over ten times more people than guns. So should we ban medics? Of course not, modern medicine saves far more lives than die from medical errors by medics. The fourth biggest is Alcohol Abuse at around a hundred thousand deaths. The USA tried banning alcohol and eventually abandoned Alcohol Prohibition as a complete failure around a hundred years ago. The next largest killer? Many more people die from automobile accidents each year, yet no one is seriously suggesting banning automobiles. This was tried in Britain many years ago - the infamous Red Flag Act - and also abandoned as ineffective. 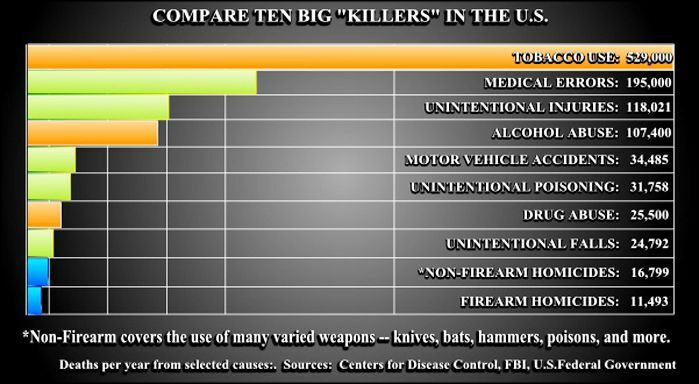 In 2011, hammers caused 50% more deaths than so called assault rifles. 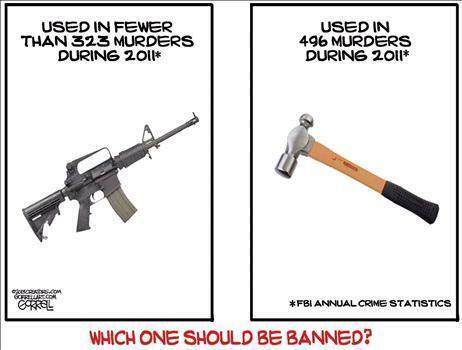 So should society ban hammers as responsible, or do we appreciate the value hammers provide? Firearms are tenth on the annual biggest killer list - and most of these are suicides. Yet guns stop much criminal mayhem and save many people's lives, as do medics. Just ask State Witness military and law enforcement master trainer, elite firearms expert Larry Correia. Or Dr. Susan Gratia, whose parents were murdered in a mass shooting in front of her eyes, see the really powerful moment shortly after the five-minute mark. But if banning medics and hammers wouldn't work, and banning alcohol and automobiles has already proved a complete failure, what makes anyone think a ban on assault rifles, or any other type of firearm, would be anything but yet another dismal government failure? 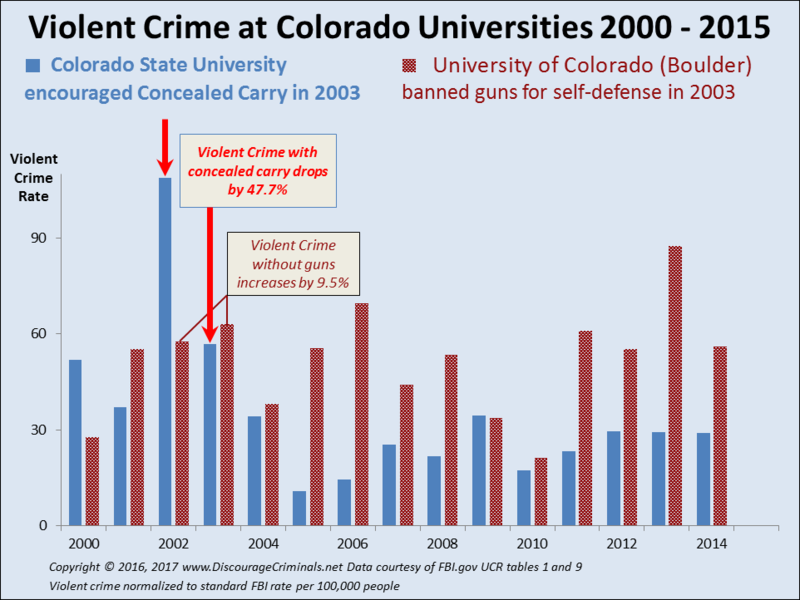 Responsible citizens use firearms to protect themselves and deter crime rather than to initiate an attack. Hundreds of thousands if not millions of crimes are stopped each year by people simply showing they are carrying a gun without firing a shot. The police carry firearms to protect themselves as well as to deter criminals. President Obama's security guards carry guns to protect him. Why? Because guns have a proven track-record in deterring attacks from both criminals and deranged individuals. Aren't you also entitled to use a gun to protect yourself from criminals and deranged individuals? Legal gun owners are responsible citizens who own a gun solely for this purpose. The most frequent reason for owning for a gun is deterrence, and there's overwhelming evidence proving how well guns provide for your protection against criminals, intruders and rapists. In 1982, the city of Kennesaw, Georgia passed a gun law - all households should have at least one firearm with ammunition. This law has no teeth, you are not compelled to have a gun, it only says you should have one if you are not a conscientious objector and can afford it. 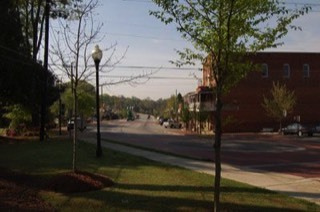 Kennesaw's crime rate has since dropped 79 percent, compared to the modest 10 percent drop statewide. The low crime rate resulting from widespread gun ownership has attracted both people and jobs. The population has sharply increased, over 30,000 now call this outstandingly safe city home. "Companies have said they want to be located in conservative areas," says the Cobb Chamber of Commerce President Bill Cooper. "Kennesaw is home to more manufacturing businesses than any other Cobb city." This is a very inconvenient truth for gun control advocates who pretend that guns are not needed for personal defense - even though their armed guards all carry guns. 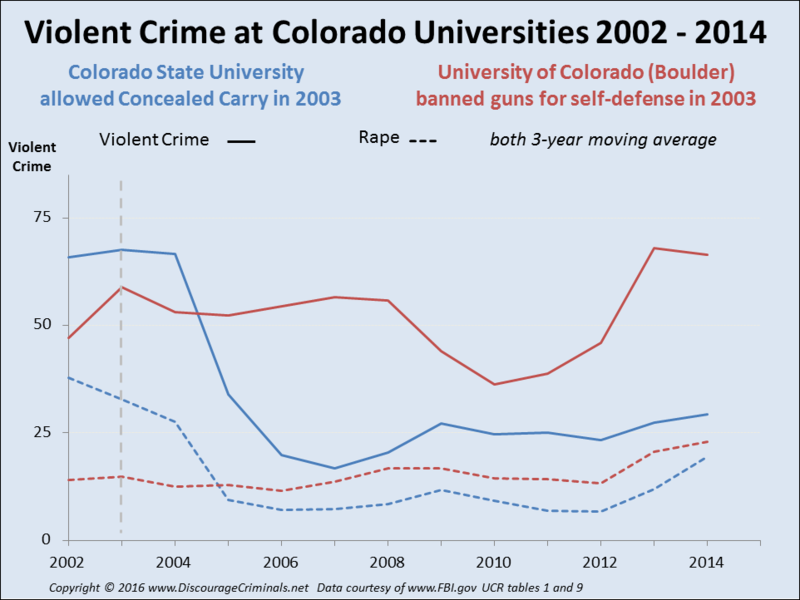 How do they sabotage the undeniable conclusion that universal gun ownership causes an enormous decrease in crime? Writing in the supposedly unbiased "Guns in American Society: An Encyclopedia," authors Englander and Snell produced a misleading, untruthful hatchet job. Yet defensive gun usages generally don't make the news. "Some belligerent youths approached John Doe on Main Street, but they ran away when he pulled out his concealed carry gun." Hardly a newsworthy item! Yet how many such incidents are there a year. Newsweek reports that one very credible investigation found: "There are more than 2 million instances a year of the armed citizen deterring or stopping armed criminals; a number four times that of all crimes involving firearms." crime rate of any city our size in the country!"